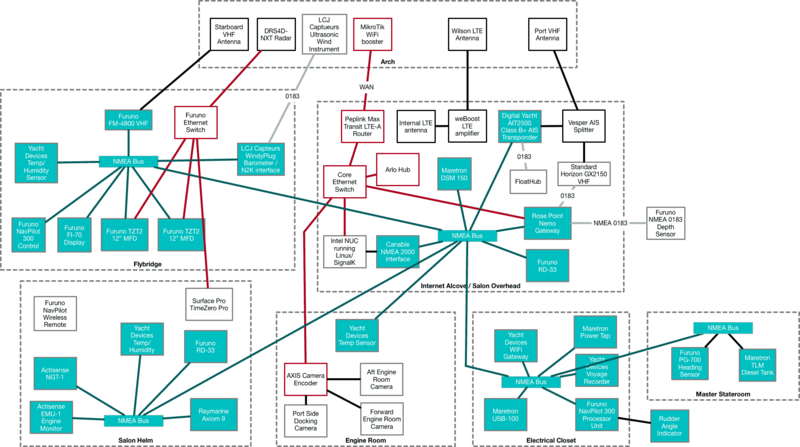 This is the first major revision of the networks, and it will definitely continue to grow and evolve as I test and work with newer equipment, and expand areas that I am interested in covering. All of this equipment is new to Rendezvous in the last 4 months with the exception of the two existing VHF antennas, depth/speed sensor, and the re-purposed Standard Horizon GX2150 VHF radio. I've been busy! 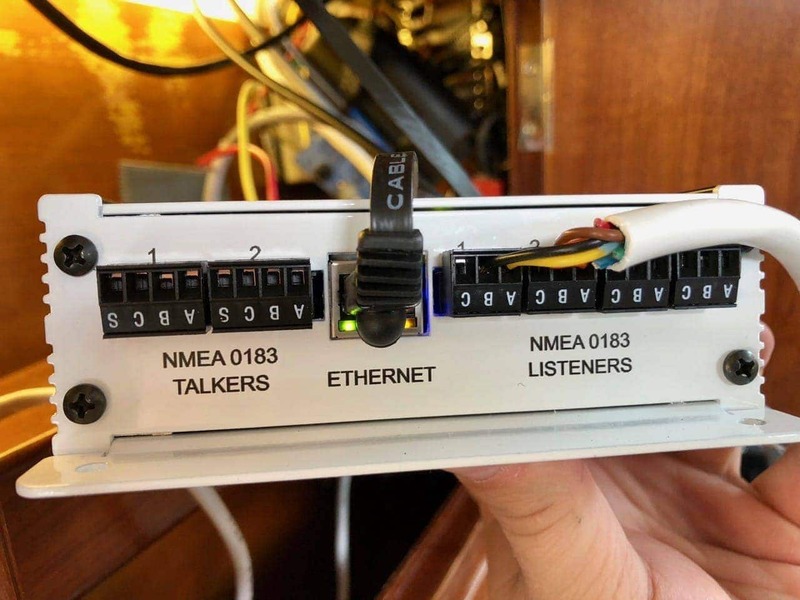 The network starts in the electrical closet, where power is provided to the NMEA 2000 bus from an always on circuit, and using a Maretron dual-sided power tee, with separate fuses for each side, planned for growth. 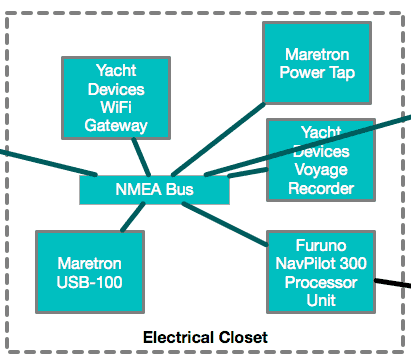 Also in the closet is the NMEA 2000 main bus, which has connections out to the salon driving area, Internet Alcove, master stateroom and engine room. 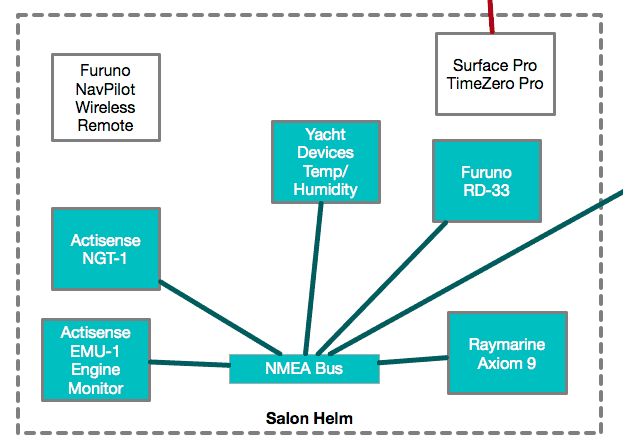 On the NMEA 2000 bus in the electrical room are several products from Yacht Devices including the Voyage Recorder and WiFi Gateway. 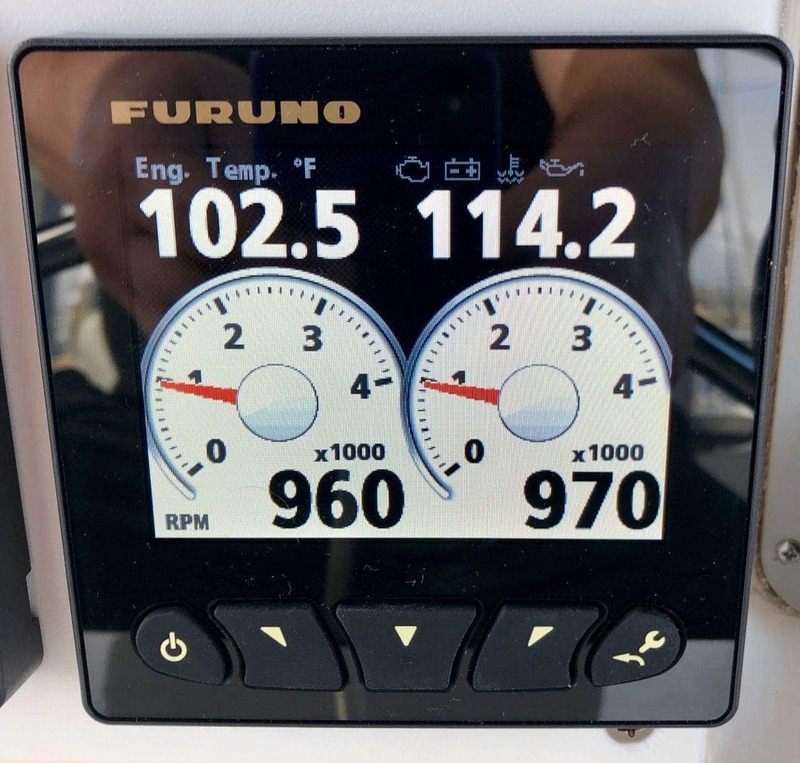 In addition, the Furuno NavPilot 300 main processor unit is here, with connections to the bus as well as to the rudder angle indicator in the stern of the boat and the hydraulic autopilot pump. This location has the highest quantity of interconnections and important devices. It has pathways to the flybridge, and onward to the arch, as well as down to the salon driving station and electrical closet, so it is a key stopping point and pass through for many things. Inside the alcove is the core of the WiFi/Ethernet network for the boat. It starts with the Peplink MAX Transit router, which creates my local WiFi networks, connects via Ethernet to the Core Ethernet Switch, and grabs Internet connectivity either through one of it's dual SIM slots using T-Mobile or Verizon, or via a cabled connection to the MikroTik Groove mounted on the arch. The switch is a TRENDnet industrial switch that runs off of DC power, and everything is connected to the always-on dedicated circuit distribution in this area. I am using this switch instead of the StarTech managed switch I've used previously only because they no longer seem to be producing it. The LTE signals for the Peplink are amplified by a weBoost amplifier and antenna positioned near the router. 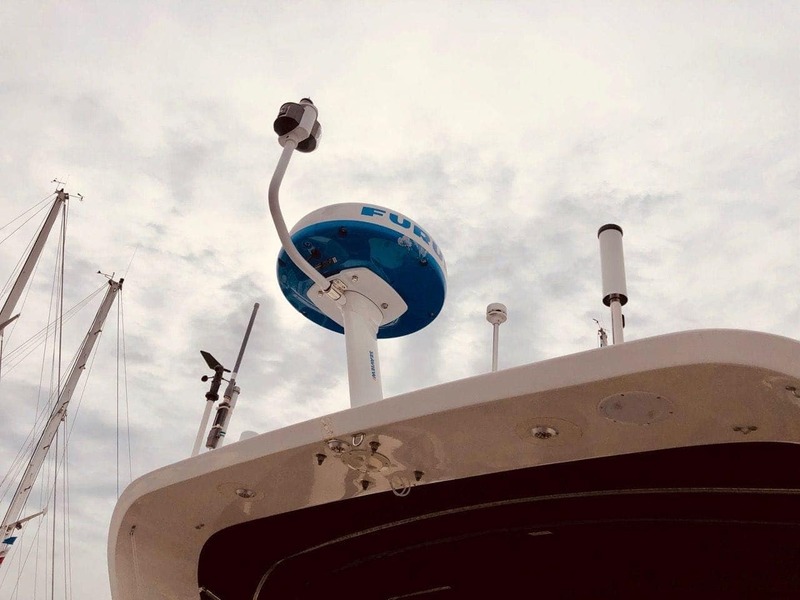 A cable from the amplifier runs up through the flybridge and to the top of the arch where a dedicated Wilson LTE marine-grade antenna sits to grab the LTE signals. 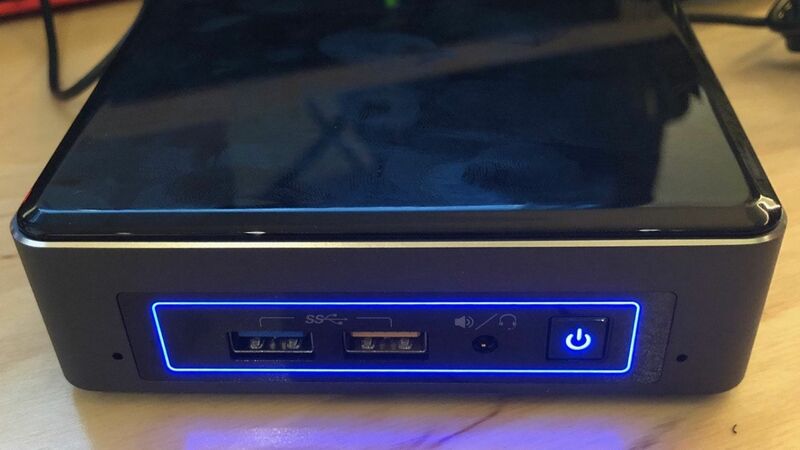 Connected to the LAN network is an Intel NUC computer running Ubuntu 18.04 LTS which is connected to the NMEA 2000 network via a canable interface. I run SignalK on this system which uses the N2K interface to grab all of the data on the bus, and allows me to use web-based dashboards like InstrumentPanel, or iOS apps on my phone and tablet like WilhelmSK. I am also using Grafana+InfluxDB to log a lot of the data from SignalK so I can see trends - tanks, wind speeds, temperatures, etc. In addition, this server runs aisdispatcher and is a mobile AIS transmission station for a number of online services including MarineTraffic. The AIS data comes from the AIS transponder, and when on, the two VHF radios, both of which send any data they see to the bus. The Arlo camera hub is also in the alcove, connected to the LAN, and powered by the same always on circuitry. In addition, the Nemo gateway provides GPS, SOG, COG, and other info to the Standard Horizon VHF, which is NMEA 0183 only. 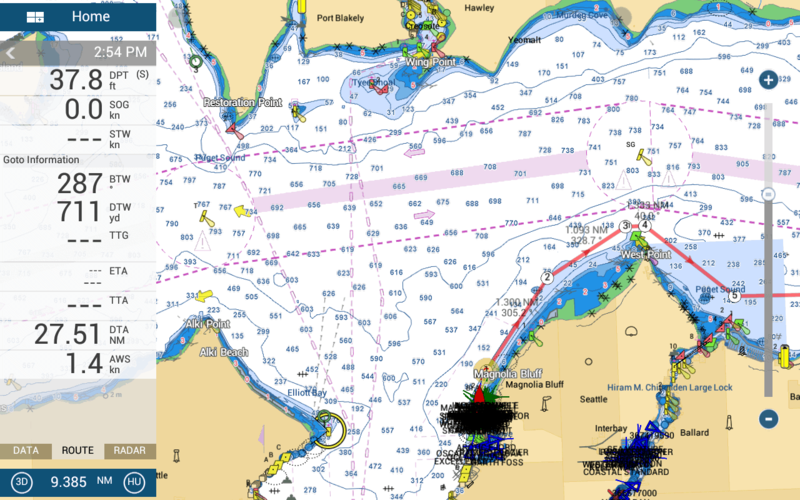 It also receives AIS targets from the Standard Horizon and puts those on the NMEA 2000 network as well. Also in the alcove is a separate circuit for VHF/communication devices. This powers the Vesper VHF splitter, Standard Horizon VHF, and Digital Yacht Class B+ AIS transponder. On the outside of the alcove there are a few instruments mounted for ease of use while in the salon area, and at the driving station. They include a Maretron DSM 150 display, Furuno RD-33 display, and a Standard Horizon GX2150 VHF. 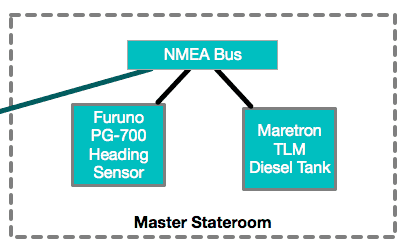 The Maretron and Furuno are connected to the NMEA 2000 bus, while the Standard Horizon VHF uses NMEA 0183 to the Rose Point Nemo gateway. The Maretron DSM is kept on 24x7 and faces out into the salon area so as you're walking by or enjoying the views from the couch, you can still see critical info scrolling by. There's also room here for expansion next to the Maretron, and elsewhere along the upper section. This location has a bus drop hidden behind the engine gauges with the Actisense EMU-1 engine monitor connected. There's also a connection the lower Furuno RD-33 display which is mounted at eye level and used for data that should always be easy to see. The Raymarine MFD is also mounted here, and although it is smaller, serves as a backup to the Furuno system in case of a major failure. I also use this MFD while at anchor to provide a good GPS signal, and provide an easy way to see location without running the more power-hungry Furuno system. The biggest piece of equipment here is the Surface Book running TimeZero Professional. I used a RAM mount to install this, and usually only use the tablet portion of the Surface Book while underway. 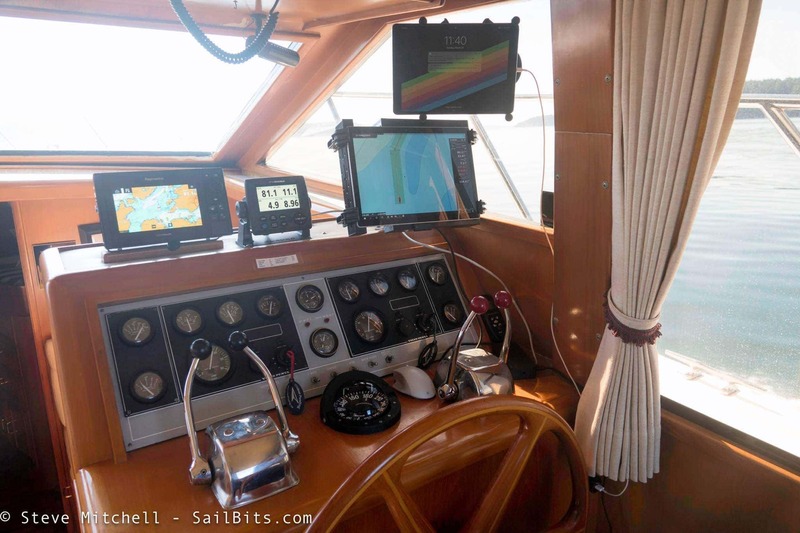 In addition, I am still using the AC-powered docking station that connects to the tablet part, which allows for a wired Ethernet connection to the Furuno Ethernet Switch in the flybridge, which allows TimeZero to control the radar, autopilot, cameras, and sync with the TZT2 MFDs. I'm still investigating whether long-term a permanent monitor would be better suited than the Surface Book tablet, but it is very nice to have it be portable, so for planning, I can grab it and attach the keyboard, sit down at the dinette, and have a fully functioning laptop. This laptop also has a full copy of Coastal Explorer on it, and can use the Nemo Gateway very effectively as a backup PC navigation software and even control the Furuno autopilot. I also have a wireless handheld remote for the Furuno NavPilot 300 system in case I choose to use the autopilot from this location. This is my primary driving station, and as such, I spent more time making this a multi-purpose and comfortable place to be from a navigation and visibility perspective. 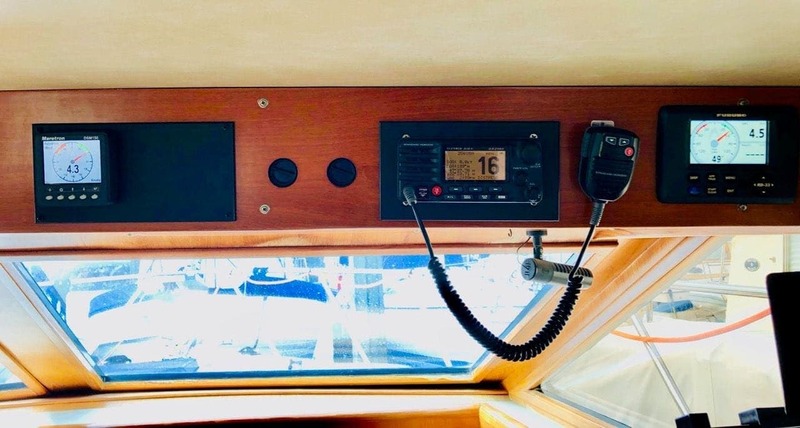 The primary part of the network here is the dual Furuno TZ-Touch 2 12" MFDs which are connected both to the NMEA 2000 network and to the Furuno Ethernet Switch. They are the core of the navigation part of my network, and provide charts, radar, dashboards for engine and other, as well as cameras while docking and underway. For charts, one TZT2 display is the master and also works in tandem with the TimeZero Professional copy running on the Surface Book at the salon driving station. 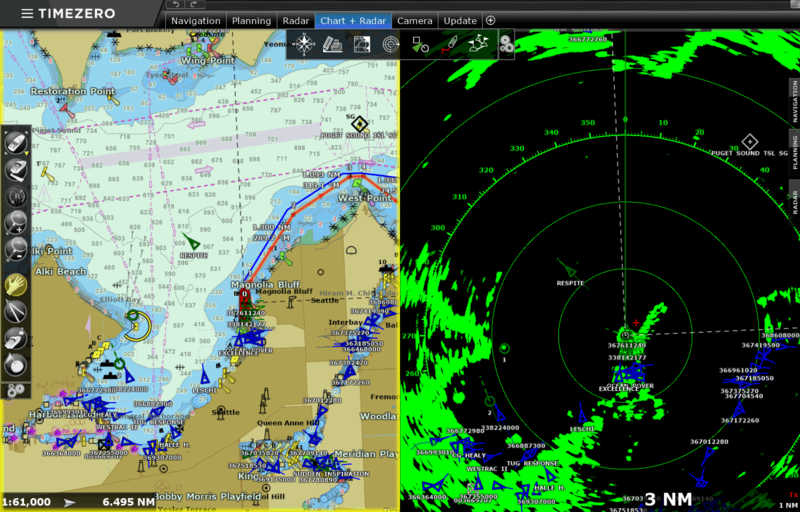 I have C-MAP, Navionics, and US/Canadian Raster/Vector charts that I use at different times. 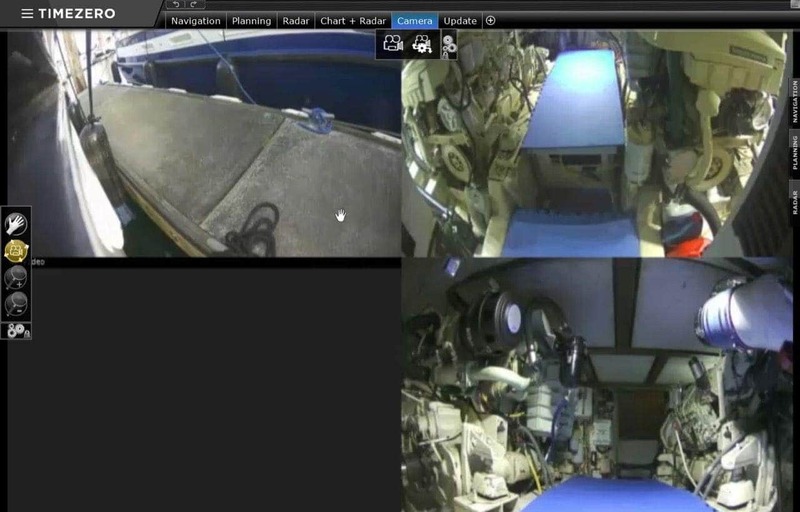 The cameras are mounted in the engine room and on the port side of the boat, and are connected to a single AXIS camera server in the engine room. It has an Ethernet connection up to the Furuno Ethernet Switch, and the MFDs can display all cameras at once, or individual ones depending on your choice. I use the port side camera while docking, and the engine room cameras while underway. The dashboard feature within the TZT2's is one of, if not the best, I've ever seen on an MFD. I don't know why more people don't talk about this, but I've already configured a dual engine page (mostly factory options with some tweaks) and a docking screen that shows speeds and wind and directions along with drift for help while docking. Almost all of this data comes from NMEA 2000. 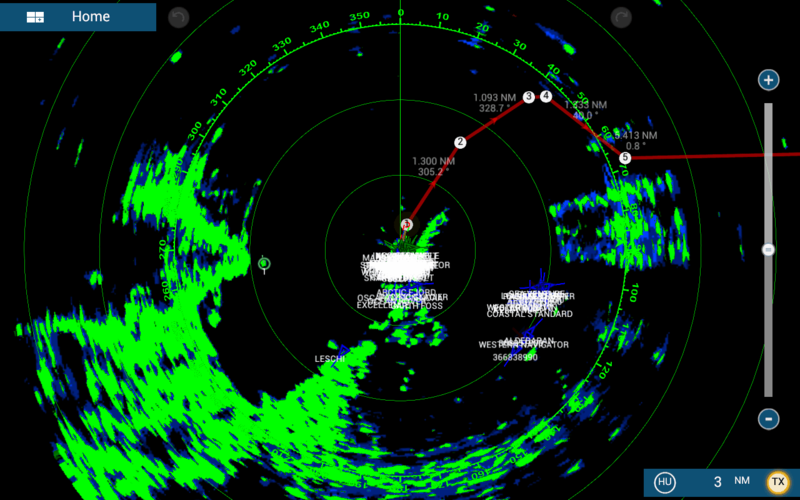 Of course, one of the main reasons I put the TZT2's in was the DRS4D-NXT doppler radar, which is amazing. The target analyzer feature in particular, which is using the doppler technology, is great as it identifies targets moving towards you at more than 3 knots, and tags them in color, as well as ARPA targets. These targets show up on the MFDs and the Surface Book/TimeZero down below. I have not investigated as to whether Furuno is sending out the correct PGNs for the ARPA targets to show up on other products like Coastal Explorer. The Furuno NavPilot 300 control instrument is also here, and connected only to NMEA 2000 for power and control. It interfaces with the processor in the electrical closet. 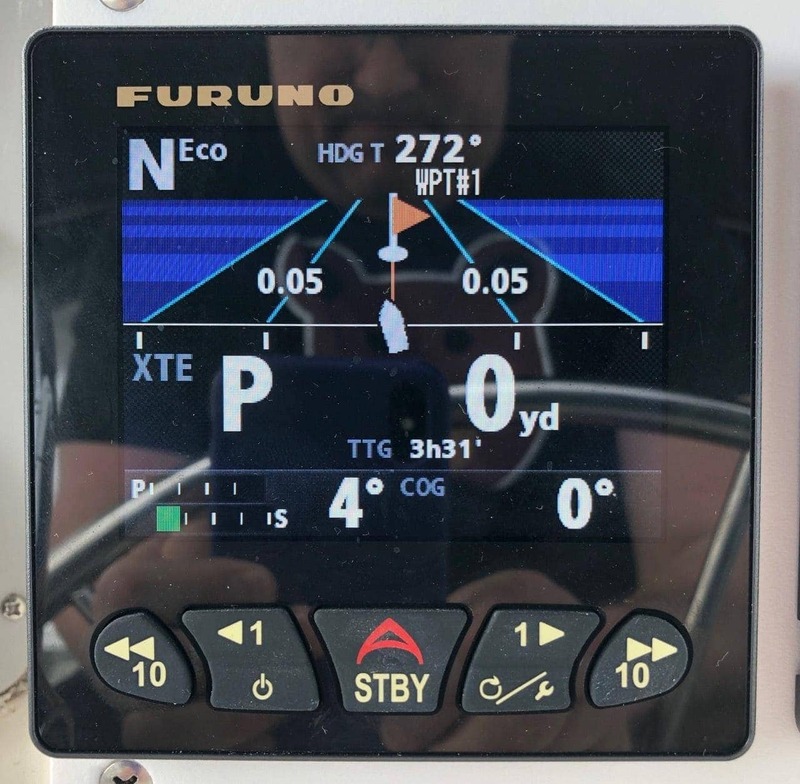 There is also a Furuno FI-70 display in this location only, connected to NMEA 2000 for network and power. The flybridge station has a truncated version of the engine gauges available at the salon driving station. In addition, when the throttles and gear levers are engaged while underway, they block some of the gauges requiring you crane your neck or look underneath them to see RPMs and other things. The FI-70 has a fantastic single-screen, dual engine display that allows me to see everything very quickly from any chair position, as well as things like boost pressure and other data courtesy of the Actisense EMU-1 engine monitor I installed. 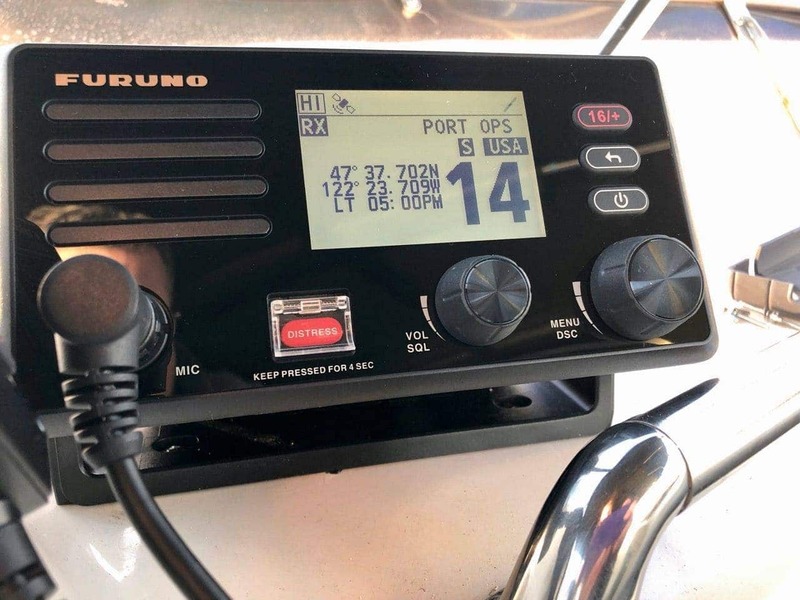 There is also a Furuno FM-4800 VHF radio here which is connected to the NMEA 2000 network as well. It transmits all AIS contacts that it is gathering, as well as a GPS source - the GPS on this thing is pretty amazing, and locks in within only a few seconds of powering on. I am really liking this radio, and will be writing about my initial impressions soon. 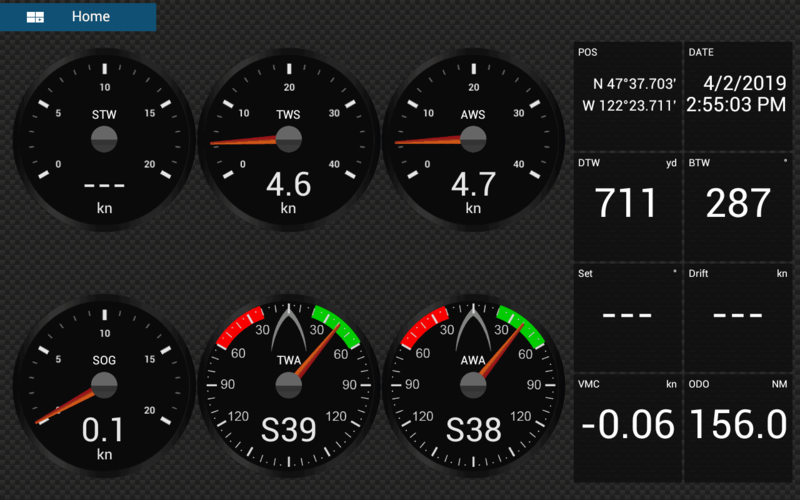 The LCJ Capteurs WindyPlug is also connected to the NMEA 2000 bus here, and provides a barometer onto the network. It also has a NMEA 0183 connection to the thin cable for the ultrasonic wind sensor on the arch. The arch houses mostly antennas and sensors that need to be up away from things. The biggest one is the Furuno DRS4D-NXT radar, which has an Ethernet connection back to the Furuno Ethernet Switch. 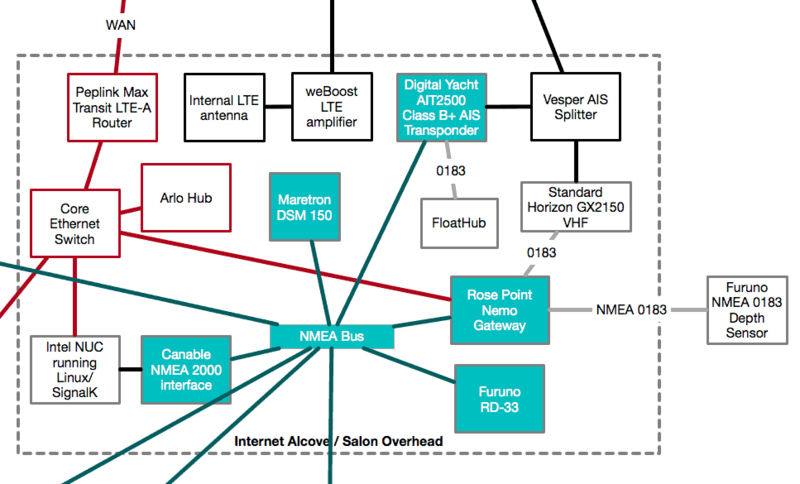 In addition, the Wilson marine LTE antenna and MikroTik WiFi extender are also mounted here, both with connections back to the Internet Alcove. The LCJ Capteurs CV-7 ultrasonic wind instrument is here as well, with a thin cable back to the WindyPlug connected to the NMEA 2000 bus drop point in the main flybridge. Engine room - there is a temperature sensor here, as well as an Ethernet connection to the AXIS camera server. 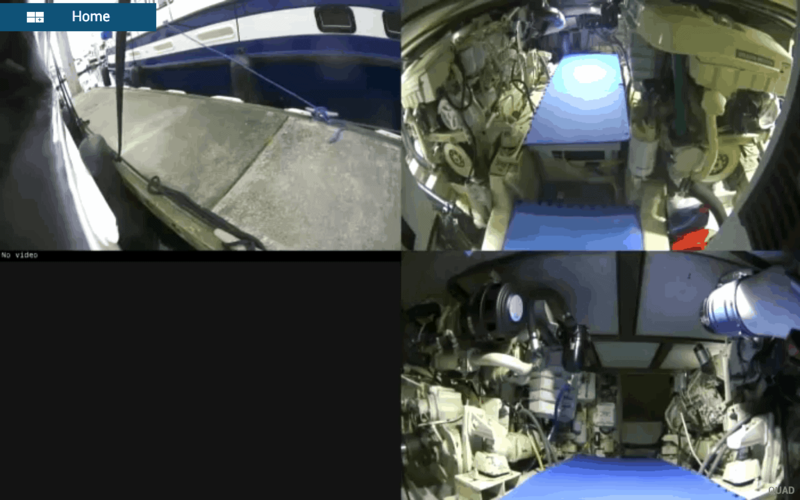 The AXIS has video cabling to three cameras right now - one looking out on the port side of the boat, our primary docking side, and two engine room cameras. I plan on expanding this later. Master berth closet - this is where the Furuno PG-700 heading sensor is mounted, very low to the center of the boat. Diesel tank - under the master berth bed is the main diesel tank which has a Maretron TLM ultrasonic sensor monitoring the level. New depth/speed sensor - need to replace this with a NMEA 2000 updated sensor - waiting to see if the newer ultrasonic one from Airmar is a good option. Water tank monitoring - I want to add a Maretron TLM ultrasonic sensor to my water tank, as I've run it dry a number of times already. Unfortunately there is no inspection port that I can find, so I need to cut a hole into it while it is in use. More cameras - maybe one on the starboard side. 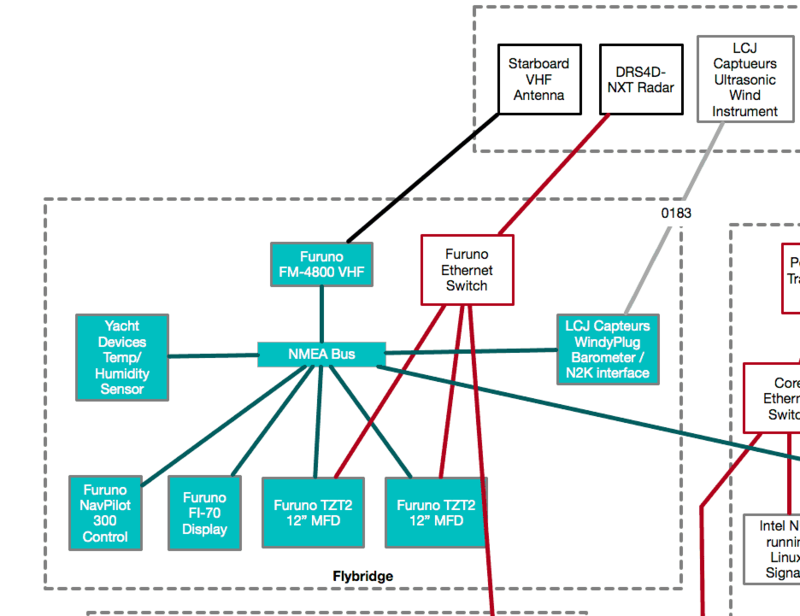 VLAN switch - The Furuno Ethernet network is not connected to anything else, which is their recommended design. 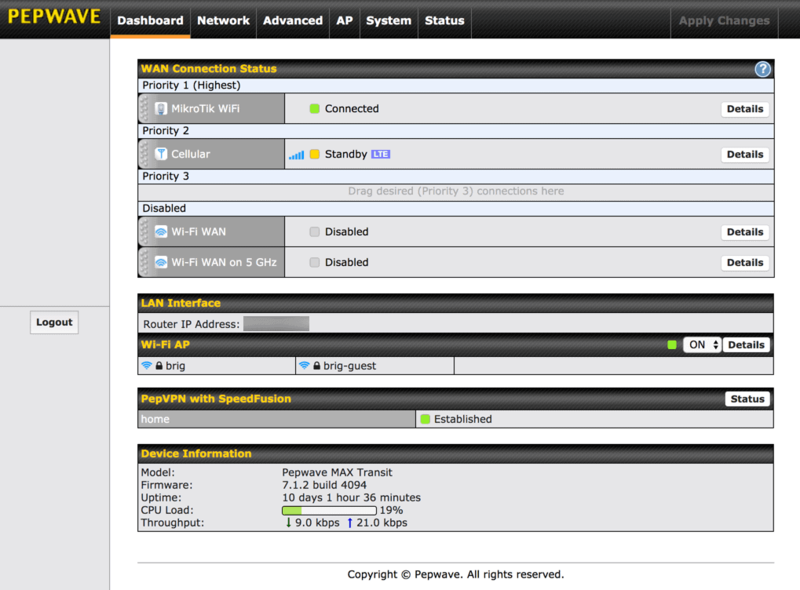 I would like to add a VLAN capable switch so I can at least have my router connected to it, and perhaps a few NATs and routes so I can utilize the AXIS camera server on other devices. I even posted on the Furuno Forums asking for clarification on network options, and was disappointed to find out severe limitations. Hopefully in a future version of software, Furuno will allow similar connectivity that they had with the TZT series, and that most every other vendor already has, including remote apps. Power monitoring - you'll notice I have zero power monitoring other than general voltage, which is very unlike my previous boats. Rendezvous has a new-ish Magnum inverter which I added a proper shunt to for SOC and amp monitoring, but that's about it. 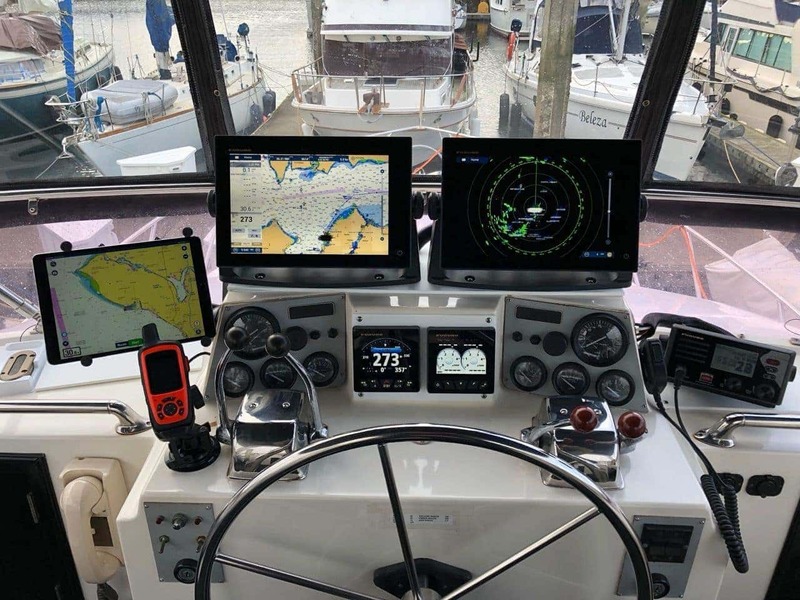 I would like to add a Victron battery monitor and their Color Control GX product, and place that data on the network so I can see it while at the flybridge underway. Generator monitoring - engine/other monitor product of some sort. Circuit control - I'm evaluating a solution that would allow CZone style control of various circuits from any MFD. Targeting things like navigation lights, etc.